When you think of storm doors, you might automatically assume that they’re designed to offer additional protection from high velocity winds or natural disasters. You’re right. When home security is a concern, homeowners tend to install these storm doors to create an extra barrier of protection for their home as well as benefit from the additional features that they offer as well. By installing a storm door, homeowners can appreciate the extra air flow it allows in during the warm weather and the additional insulation retention capabilities for winter. Today’s models are designed to do more than just protect your home, they’re attractive, functional, and even energy-efficient. 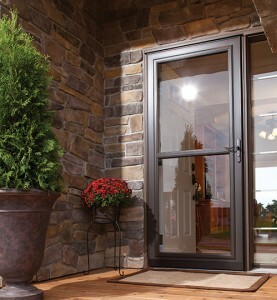 Storm doors offer a variety of features that protect a home’s front entry from severe weather. Some doors are fitted with kick plates to protect the lower end and even feature grids and dead bolt locks. Vents are typically installed on the top and the bottom to provide air circulation and can even be fitted with a screen door so children and pets can enjoy the direct sunlight and open-air feeling without having the means to wander outside. Some storm doors are designed to be interchangeable. Meaning, they can be switched out from a screen fitting to glass or acrylic panels. Self-stored models are an alternative option that doesn’t require the user to necessarily have to remove the fitting to swap it out for another one. Instead, they allow the panels to slide into another position for ease of use. Be sure to speak to a manufacturer in regards to these additional options. Bio: ETO Doors is a custom door manufacturer based out of Los Angeles that offers a variety of doors for purchase online with many customizable options, such as oil-rubbed bronze hinges and hand-carved details. ETO Doors also has showrooms in Las Vegas and New York. Read ETO Doors reviews, browse their selection, and more online at their site.